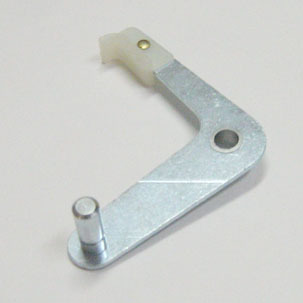 Slingshot bumper kicker arm with white nylon tip. Commonly worn or broken part on many used games. Has long linkage pin which is used to activate scoring leaf switch in older electro-mechanical (EM) and early/mid electronic solid-state (SS) games. Can also be used in later games without scoring switch (part # A-12664. Need just the nylon tip? Order part # 03-7501.